Glasgow Angling Centre has teamed up with Andrew Toft, World Champion Spey Caster, AAPGAI Master Instructor and part of the Mackenzie product development team to offer Spey Casting instruction and information. If you've missed Andrew's previous featured articles, he talked in great detail about his involvement with Scott Mackenzie, Double Handed Spey Rods, and latterly, Spey Lines. In this feature Andrew talks about the Roll Cast with a two handed fly rod, offering explanation on various faults and their possible consequences. Andrew also asserts that once you become more aware of the common problems associated with roll casting and their source, it is possible to correct those faults and become a much more efficient caster. The basic roll cast is used to roll out slack line prior to making another cast, or to lift a sunk/intermediate line to the water’s surface. The cast also forms the foundation of all the Spey casts and is an excellent technique to use when learning how to master correct D loop and anchor formation, acceleration and rod tip path. It is especially helpful in learning how to vary the stop and acceleration to influence the shape and speed of the casting loop. It is important during any of the casts that we have the ability to make suitable adjustments when necessary to suit the varying conditions we encounter and the variation in tackle and equipment being used. The Roll Cast falls mainly into two categories: the presentation Roll Cast and the line lifting Roll Cast. During the presentation Roll Cast we cast a tight loop of line that unrolls above the water. However when using sinking lines, heavy tips or flies we would have to adjust our movements to cast a more open loop of line almost along the water’s surface. Heavy lines and flies do not respond well to short, fast movements. It is much more effective to use a longer movement and use the momentum of the line within a more open and slower loop shape. In the following paragraphs I intend to describe mainly the presentation Roll Cast as once this technique is understood then any necessary adjustments are much easier to make. 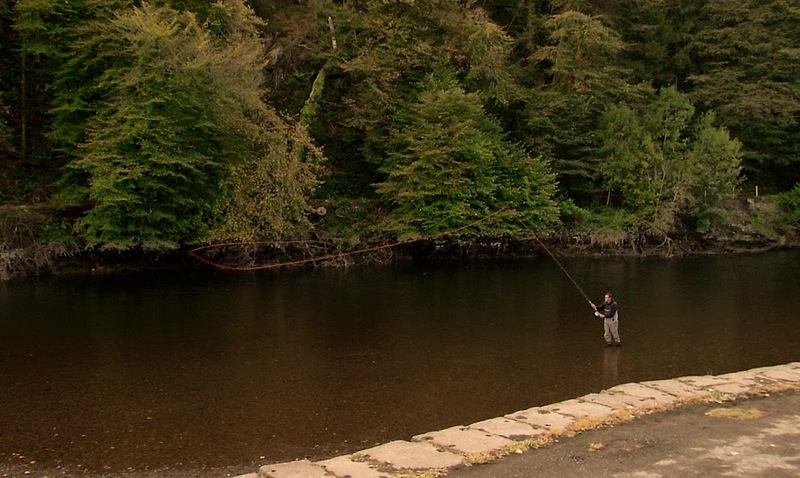 Stance - One very important aspect in all the Spey casts is stance. This becomes more important when we progress through the various casts. We do not always have the luxury of placing our feet exactly where we want to in the river, but I always encourage individuals that are learning to Spey Cast to place the leading foot corresponding with the same side they are casting from. The main purpose of this is that it provides excellent balance and also a natural block which helps prevent any excessive over rotation of the shoulders which is especially important when Spey Casting. Roll Casting Movements - Starting with around forty feet of line and the rod tip positioned low at the water’s surface, the first movement is to slowly raise the upper hand and push out the lower hand. It is important to tilt or cant the rod slightly to the side to keep the line and fly safely away from our body. As we do so the line will begin to slide along the water’s surface slowly. This movement is continued until our upper hand is around head height and the lower hand is positioned out from around the centre of our body. At this point the arm and forearm should resemble 90 degrees with the lower arm bent to around 45 degrees. This gives us efficient and adequate range of movement and is often referred to as the key casting position. It is important to make sure the upper hand is positioned at around head height prior to making any forward movement. This not only maximises the line in our D loop behind the rod tip, it also allows us to apply the correct path of movement when making the forward cast. This movement will be very similar in all the Spey casts in that it is a downward and forward movement. If our upper hand is positioned too low and too close to our body at the key position, it naturally encourages a forward push which is ineffective and will often result in problems. Forward Delivery - From the key position as mentioned above we can then make a smooth accelerated movement downwards and forwards. This should begin very slowly and build up in speed ending with a positive flick to flex the rod. This is immediately followed by a sudden stop right at the last margin or end of the casting movement, often referred to as our 'power application.' It is these critical movements that turn the rod tip over forming our casting loop. As the line begins to unroll we can then lower the rod allowing the line to fully extend. Most of the movements described above will remain the same up until the key position. From this point we will still accelerate smoothly but the power application will start sooner and end later and will not be just as fast. In order to do this correctly our hands will have to move slightly further and rotate the rod over a wider angle. We will be stopping the rod at a lower position although not as firm. As the rod tip has rotated more within a wider area at the end of the cast it will result in a wider slower casting loop. Fast tight loops are formed by a smooth acceleration followed by the most speed or power application in a very small area at the end of the casting movement. This must end in a firm high stop to prevent the rod over rotating and opening or distorting the line. Slower more open loops require an acceleration followed by the speed and power application over a larger area at the end of the casting movement. The rod will rotate more; the stop will be later than and not as abrupt as before. This longer wider movement results in a slower, wider loop shape that is more suited to sinking lines and heavier equipment. Over rotation of the shoulder during the D loop formation. This is generally caused by incorrect stance and also pulling the line back into position with the upper hand - the D Loop and anchor will often turn in behind the caster. Correcting the stance and sliding the line into position using both hands as described above will help to align the shoulders during the delivery. If the caster moves the rod back into position too quickly it will encourage slack to form behind. The D loop will not be formed under tension and there will be excessive line on the water’s surface. (line stick) This will also be evident if the rod is tilted too far back during D- loop formation. As mentioned above power application and acceleration is varied. However if the power application is far too early (too fast too soon) within the casting movement then the rod tip will send the line upwards and the rod continues to rotate during the rest of the movement opening the line and forming a large ineffective casting loop. If this power application is very abrupt or the movement overly short then the rod tip will dip excessively or buckle. This will influence and misshape the line in a number of ways and possibly cause a tailing loop or collision. We must always provide smooth acceleration and save most of the speed until the end of the cast. If acceleration and power application is inappropriate due to creep then the above would also apply. The line is a great visual teacher and can tell us a lot about the path of the rod tip. This is by far the most common fault where all the power comes from the top hand push. The rod tip is the last point of contact between the angler and the line. We generate speed in the rod tip by flexing the rod with both hands, maximum speed coming from the lower hand. In order to transfer this speed and energy down the line and form a loop, we must stop the rod correctly using both hands. We cannot flex the rod efficiently with only our upper hand, nor can we stop it using only our upper hand. I fully understand the difficulty individuals have in trying to stop using dominated upper hand movements. When explained, they fully understand the logic and concept however initially their hands will not cooperate. Mastering the movement requires continual practise. In the next blog, I will be talking about the Jump Roll cast and how to perform D and V loops. Andrew Toft is an AAPGAI and FFF Master certified instructor providing Spey Casting Instruction from beginner to advanced levels. He has attained a high level of proficiency in all aspects of fly casting with both single and double handed rod. 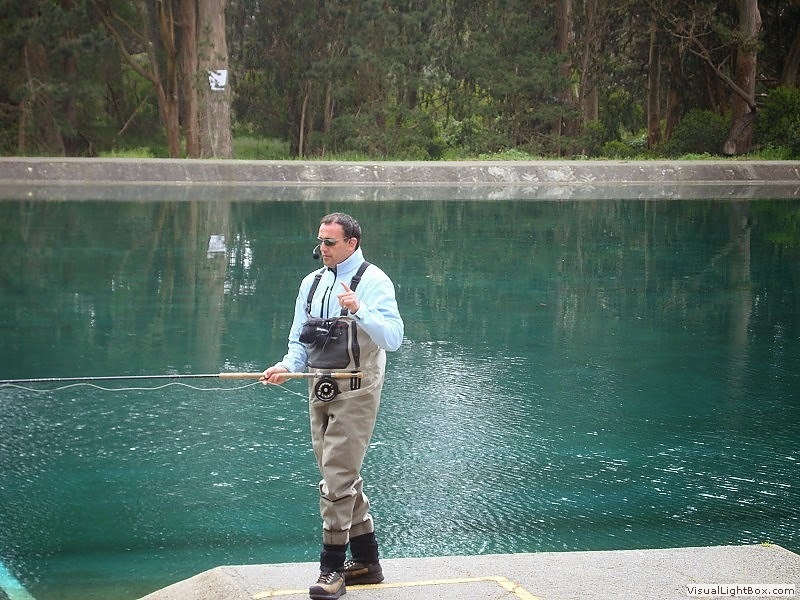 He is also regarded as one of the most respected and talented instructors on the fly fishing scene. If you would like to improve your casting technique you can Contact Andrew here for more information.